The Scandinavian design is all the range a the moment and its not difficult to see why. Scandinavian interior design is dictated by the climate in this part of the world where inhabitants endure long dark harsh winters and much of this time is spent in the home. And so Scandinavian people tend to design their homes with an emphasis on light and purity to lift the spirits. When entering a contemporary Scandinavian home you will be stuck by the white furnishings and walls, in many ways this can be seen to represent the snow falling outside of the home. Yet white also brings light and brightness in the dark. Although there is a huge emphasis on white walls and furnishings, this does not mean that colour cannot be added, indeed without a splash of colour, the Scandinavian home would feel cold and hostile. However the colours used in this design also tend to be bright and positive. Use colours such as bright blues and greens or even soft greys, these will bring a fresh and airy feel to the room yet will also serve to make the space look bigger. Additionally, paint rather than wall paper is normally used in Scandinavian homes. Another defining feature of Scandinavian design is wood; wooden furniture and beams tend to be used throughout the home and give a rustic and cosy feel offering a way of bringing the outdoors indoors. Natural stained and simple looking furniture would fit perfectly with this particular design. Although there is an emphasis on nature, remember the importance of bringing light into the room; mirrored furniture is becoming increasingly popular with this particular style because of the reflective light elements they bring. When designing your Scandinavian style room, keep minimalistic in mind. Give careful consideration to the furniture because they will make a huge statement in a light and airy room. Think comfort but also statement furniture which will say the most about your personality and the design you have chosen. When choosing your seating furniture, ensure that you select items with the colours and materials of the theme in mind. For instance, we recommend our Scandinavian armchairs to make the perfect statement. 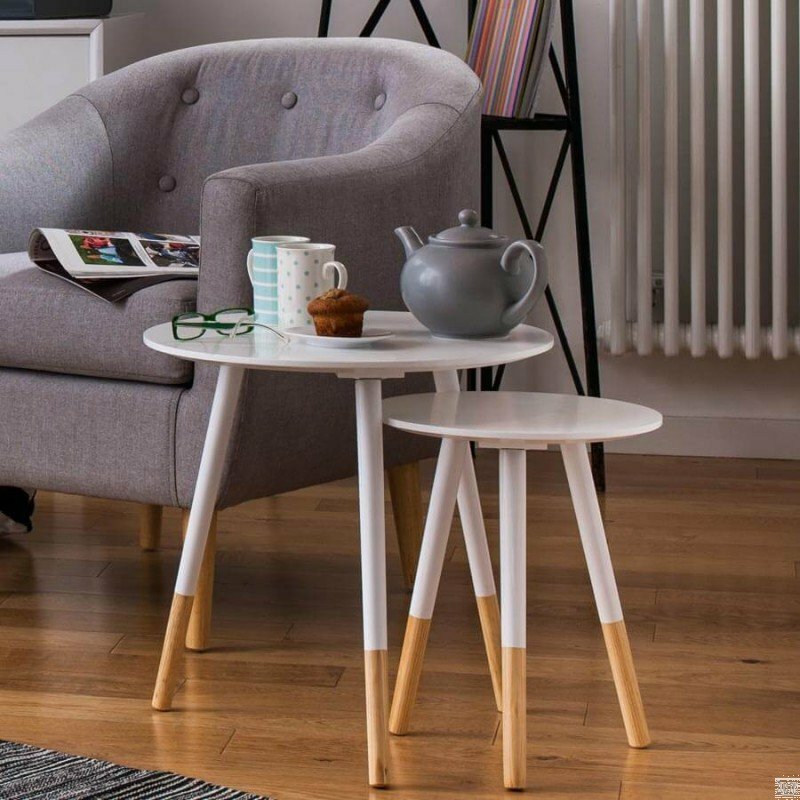 Straight lines and circular furniture are used as part of this design; we recommend these side tables, available in white and grey, to bring the Scandinavian look into any room. 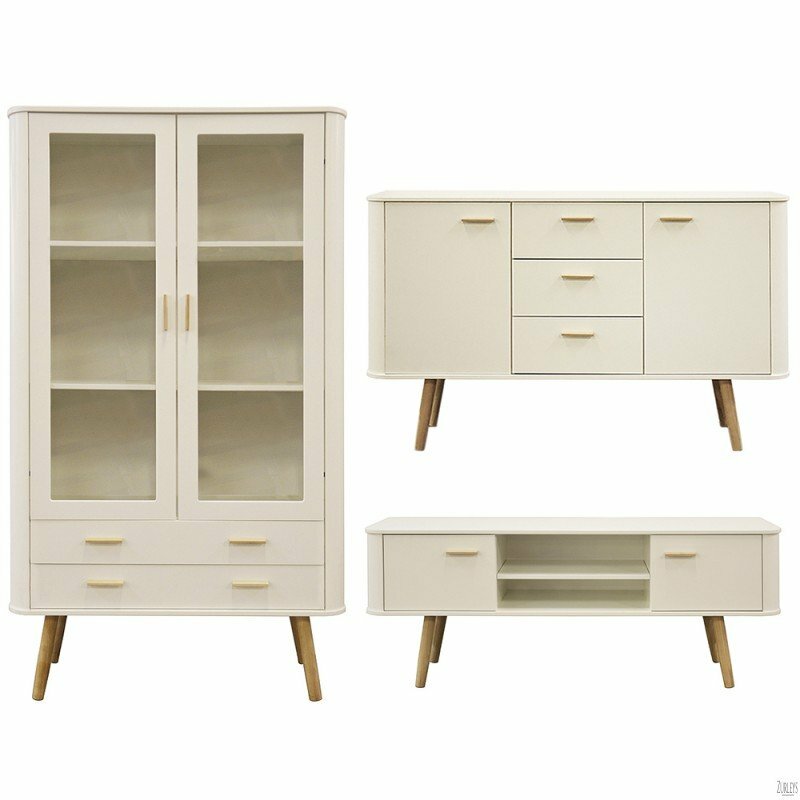 Take a look at our Scandinavian White Oak collection, these pieces will perfectly compliment this style. When considering your lighting, use this piece of furniture to make the biggest statement. Go for something daring. 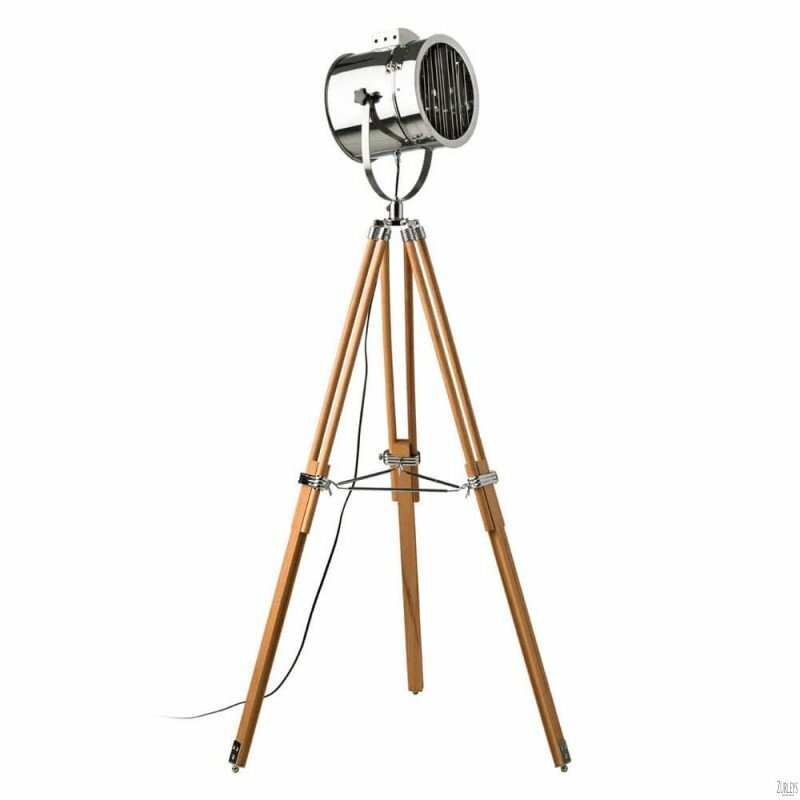 A tripod lamp brings style to any room and our Scandinavian tripod lamp is both contemporary and bold. Open shelving and book cases are a part of this design, so if storage is needed in your lounge, make sure these furnishings continue to create the open feel of the room. Sideboards are also useful for storing essential items such as placemats and glassware. Remember Scandinavian design is all about minimalism so don’t try to add too many features to your wall. 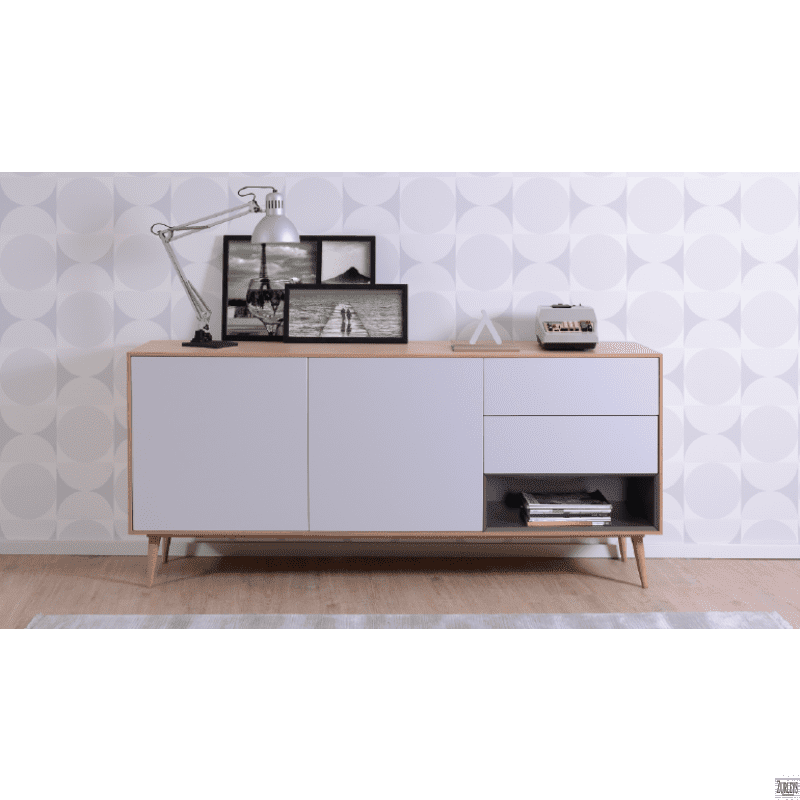 Scandinavian homes tend to use black and white photographs alongside contemporary art work as these can add something of your own personality to the room and allow you to experiment a little with the style. A circular mirror, such as our Modern Maria Mirror would work well with the theme. If you would like to add something extra to your room consider rugs which create a warm and cosy feel. Fur cushions would also add that Scandinavian feel to the room. As there is a great emphasis on light, try to keep window furnishings to an absolute minimum; often Scandinavian homes lack curtains however if you do wish to dress your windows think of contemporary curtains which are tabbed and lack any fringes to allow as much light as possible to flow into the room.